Now having lived in Japan for close to five months I am sure many would like to know what exactly church is like here based upon personal observation. (From the prospective of an American who has been associated with Baptist-oriented churches for his entire adulthood.) The purpose of this post is informative, not to be used for unwise comparison. The church that I have been attending recently celebrated its 50th anniversary. This church was apparently founded by Baptist Missionaries from American in 1957 who after a period of time turned the church over to a Japanese national pastor. This era in which the church was founded was still in a time of great pioneer missions in Japan after World War 2 where missionaries were encouraged to come to this country and found new churches. That generation of much-needed pioneer missionaries are now long gone. Today some pioneer missionaries exist in unreached areas of Japan, however most modern missionaries in Japan appear to be working together in already existing para-church organizations or with established churches. A few years before I came here the previous pastor retired, and a new pastor named Elisha started to pastor the church after receiving a seminary education in the United States. (Even after retiring the previous pastor is still preaching at another local church temporarily. The average Japanese pastor age is something around 60 years old.) Now with a regular attendance of anywhere from 200 to 300 people each Sunday this church is apparently a rare exception to the average Japanese church which is said to have about 30 people. So, what is it like here? Immediately upon coming here it can be noticed that many people are busy doing many tasks at the church. From my observations the Japanese people appear to be very task-oriented whether in church or out of church. (Japanese are known to be an industrious people.) Many are involved in teaching, disciple making, church maintenance, and other various functions. Men who are active in the church often work “salary man” hours during the week (7am to 10pm Monday through Friday), then come in and do church activities until late evening on Sunday. (Not every man is like this, however many are.) From what I have seen these men do this not because they have to, but because they are passionate about their church. To them, this is normal life. Sunday consists of three services (9am, 10:45am, and 1:30pm) with a Sunday school for children (9am) downstairs as well as a teen service (10:30am) downstairs. At 12:00pm lunch is prepared every Sunday after the teen service downstairs by volunteers and is partly subsidized by the church. It costs each person about $2.00 with first time guests eating free. Different groups are assigned to clean up after lunch each week. The teenagers actually clean once a month! Everything appears to transition quite quickly as well as smoothly as everyone knows what is expected of them without having to be told what to do. No one has to come and check to see if the cleaning job was completed or not completed. After lunch the third service (1:30pm) occurs for those who have not attended either of the other two previous services. This third service is geared toward new-comers. For the rest of the people who have already attended one of the previous services groups by division of age and gender gather together for a period of bible study. Some that are not involved in groups are involved in one-on-one discipleship. Mostly new believers are discipled for a long period of time (4-6 months) so that they can understand Christianity thoroughly before becoming Baptized and later joining the church. Apparently in this land in the past people who got baptized believed that their duty to church was done, and decided to leave, so the 4-6 month education period was placed to prevent this from occurring. Though the church has three floors with various rooms one would think that there would be plenty of space to do the activities, however each room is claimed for long periods of time by various groups. This church makes excellent use of the building as well as the rooms on Sunday as well as the entire week! During the week various groups meet for discipleship, staff meetings/tasks, prayer, and an English program called ‘Kids Brown’. I am sure many other events take place at the church of which I am unaware of due to my time at language school during the weekdays. Also, on Wednesday each week at 8:00pm some church members get together for a short devotional and prayer meeting. Given the lack of space the church has purchased property next door and plans on building a second building for the purpose of more rooms for church related teaching, discipleship, and various ministries. Given that Japan’s population is rapidly aging, this church has decided also to build a dedicated area for taking care of senior citizens as a ministry. 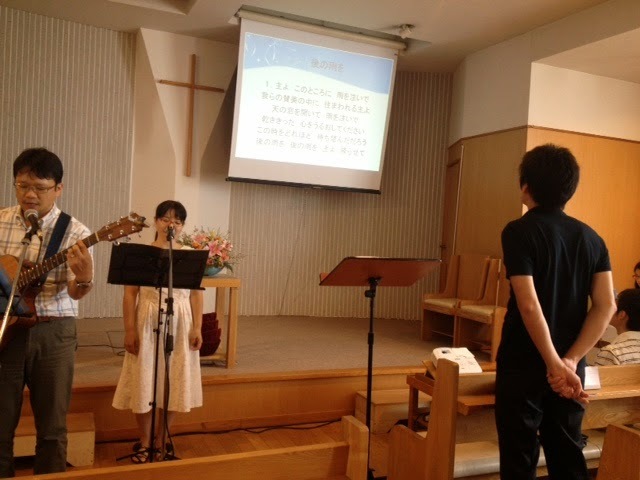 On another blog I will speak more of Japanese church! Feel free to comment below or email me a question about church in Japan. Blessings!